I have added "positives/negatives" for each doe to help people better understand & learn about our goats. Camanna WR Moonlight Serenity VEEV 88 - "Sereni"
Notes: Was given the opportunity to purchase Serenity in 2013 for my son as a Showmanship partner and I am so thrilled to have her here! She is a real sweetheart, loves my son and our family! Sereni has a gorgeous wide, flat, level rump (scored "E" in rump on her Linear Appraisal just like her momma did! ), deep body capacity with a long lean neck and beautiful feminine head and face. I really love everything about this gorgeous doe. She has fabulous well placed, large teats and INCREDIBLE udder texture! I would like to see a bit higher rear udder, but as the appraiser pointed out, a doe with such soft supple udder texture won't have a high tight rear udder because the skin is just so soft and supple. Our appraiser gave her an "E, Excellent" in Udder Texture, Dairy Character, Body Capacity, and Rump too!! He just loved her overall! Goals: Goal is to breed her to bucks that should produce higher/wider rear udder, more like her momma's picture to the right. Positives: Exceptional body capacity, perfect feet & legs, beautiful head & ear set, long lean neck, long deep bodied. Beautiful mammary system w/nice medial, nice big well placed teats, wonderful capacity and an EXCELLENT RUMP! Negatives: Needs higher wider rear udder & slightly improved foreudder. 2013 LA: VEEV88, scored "Excellent" in Rump, Udder Texture, Dairy Character and Body. An 'E' in Rump is extremely hard to find in Nigerians! We are VERY proud to have this lovely lady here!! Sereni's dam appraised EEEE91, also scored E in Rump! 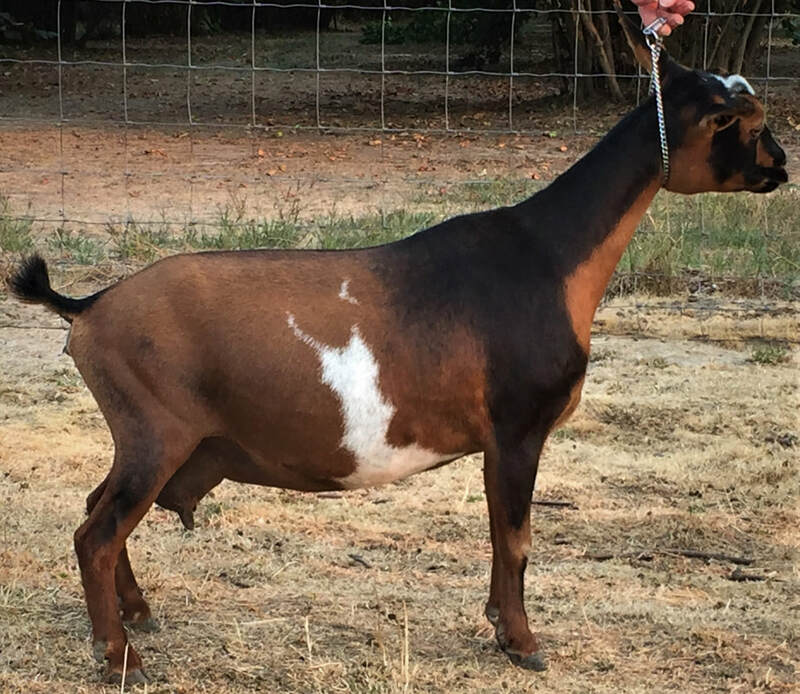 GCH Bellafire DC Sweet Alyssum 6*M VEEE 91 - "Ally"
Goals: Goal is to always breed her to bucks that genetically should improve shoulder assembly & also improve medial strength. Positives: Great body capacity & width, nice rear leg set/angulation/width, great feet & legs, beautiful head & ear set, long lean neck, very long bodied. Beautiful mammary system w/high wide rear udder, nice foreudder, and amazing capacity! "Aly" was my personal pick for 2011. I hadn't intended to retain her, but everyday that goes by, I am more & more happy that I did! And now, years later, you couldn't pry my beloved Aly out of my cold dead hands - I LOVE HER THAT MUCH!! She has beautiful body structure with wonderful flat ribbing, beautiful angulation, good legs/toes, & improved shoulder assembly over her dam. She is very level across the rump & topline too. The 2012 ADGA appraiser was very impressed with our young Deco daughters. 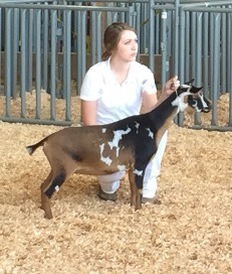 Oregon State Fair ADGA show, in a very large dry yearling class, Aly placed 2nd in her class of 17 dry yearlings! UPDATE June 2014: Aly did amazing at her first show as a 1st freshening 3 yr old in with a big group of 2nd freshening doe's! 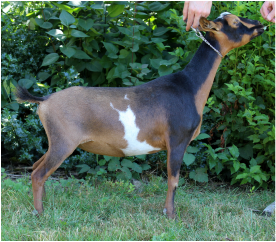 She consistently placed 2nd behind a GORGEOUS 2nd freshener, who happens to be out of our old buck Rosasharn GX Cadbury & is paternal sibling to our Bellafire CB Macy's Milky Way! So we felt like winners all the way around! She also easily earned her milk star in a 1-day test in 2014 making her a 6th generation girl! 2015 -Triplets, 1 buck, 2 doe's, 1 doe ret'd "Sweet Honey Bee"
​2016 - triplets, 1 buck, 2 doe's, 1 doe ret'd "Bridal Bouquet"
2017 - triplets, 2 bucks (sold), 1 doe ret'd "Paint It Black"
- Finished ADGA Grand Champion Doe! Below: Ally on far Right and her yearling daughter Flower in center. Patty Cake on far Left. Bellafire DC Midnight Melody 1*M VEEE 90- "Meli"
Melody is my daughters 2011 retainee. She is very eye-catching with her solid black color & crystal blue eyes! Not to mention her endearingly adorable personality! She has no idea she is a goat, & honestly believes she is part human/part lap dog!! I look forward to another Deco daughter in the herd. The 2012 ADGA appraiser was very impressed with our young Deco daughters! He made comments on their nice dairy character, sharp withers, and improved shoulder assembly over their dams. UPDATE 2014 - Melody has done very well as a first freshening 3 yr old. Placing in the top of her class every time out! Her rear udder width is amazing! As is her capacity, rear udder height, teat placement & size, texture, etc etc etc!! She is just a gorgeous dairy goat! 2015 - Meli had an off year... she struggled with mineral issues earlier in the year & once we got that figured out she just couldn't kick up the milk production again to be the 'big bang' that she usually is. 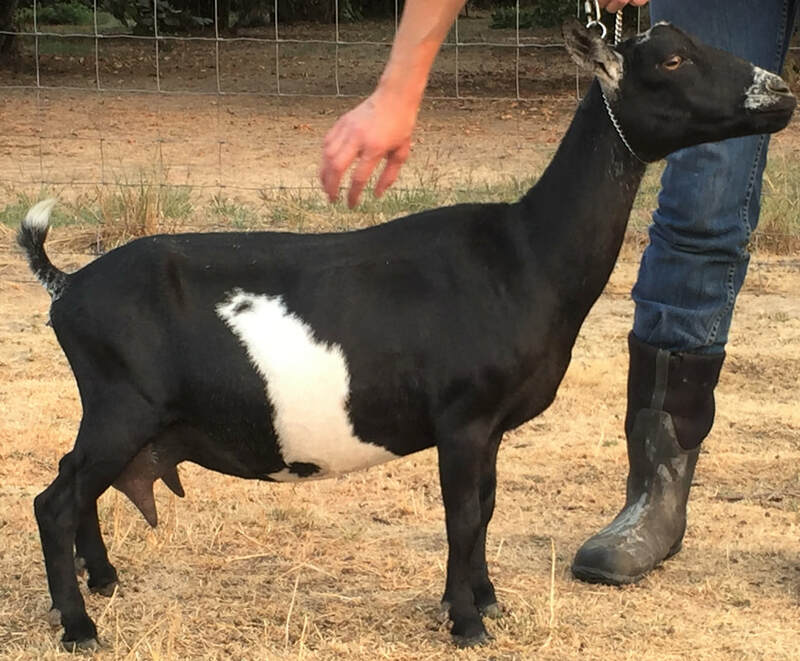 The Oregon State Fair judge did repeatedly comment on her beautiful "Spot On General Appearance" and said he could see the incredible potential there if she had been a little stronger with her production. Goals: She finally gave us a doeling in 2016! Negatives: Love this doe! If I REALLY had to pick her apart, now that she & her sister have matured so much, I wish she had a little more rear udder height like her sister Ally does. But Meli has much better elbows & much larger teat size/shape than Ally. 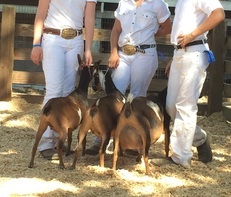 *Above far right: 2012 Oregon State Fair, partner in Grand Champion Intermediate Showman :-) and Grand Champion Jr. Doe 4H. Melody also placed 3rd in a very large class of dry yearlings at the Oregon State Fair ADGA Open show! Her sister "Ally" placed just in front of her. ​​​Click here to see her full ADGA pedigree. ​2016: 1 buck, 1 doe ret'd "Maid Marian"
2017: 1 buck, 2 doe's, 1 doe ret'd "Midnight Blu Moon"
Almost always 2nd or 3rd in her class, usually standing right behind her 3/4 sister, Ally :) Now that Ally is a finished GCH I'm hoping Meli can 'step it up' and start seeing the winners circle herself. Algedi Farm DJ Cadenza EVEE 90 - "Denza"
Notes: Ahhh, my beloved Andante and the ever fabulous Jupiter have blessed me with a baby girl of my very own!! I am thrilled to add this little gem to my herd! Denza freshened with a beautiful little udder! Teat placement is lovely, teat size is good although I'd like them larger, would like more capacity but that should improve, medial is strong, side & foreudder attachments, orifices, etc are all GREAT! ​Positives/Negatives: Goal is to always breed her to bucks that genetically should improve udder capacity & teat size. Positives: Overall a stunning doe, with a gorgeous strong straight topline, excellent length of body, long lean neck, good feet & legs, great rump, head & ear set. Beautiful little udder with great medial, great teat placement & foreudder. Negatives: Would love for her to have more udder capacity and larger teats. Some of this may come with more lactation's & more kids..
2013 LA (Young Stock): V Ec V V, scoring Ec in Rear Legs, Back, & Rump too! Scoring Very Good in all other catergories including Head, Shoulders, Front Legs, Feet, & Body Capacity! Our appraiser said Denza was THE BEST Young Stock Nigerian he had scored so far this year!! Woohoo!! Go Denza! 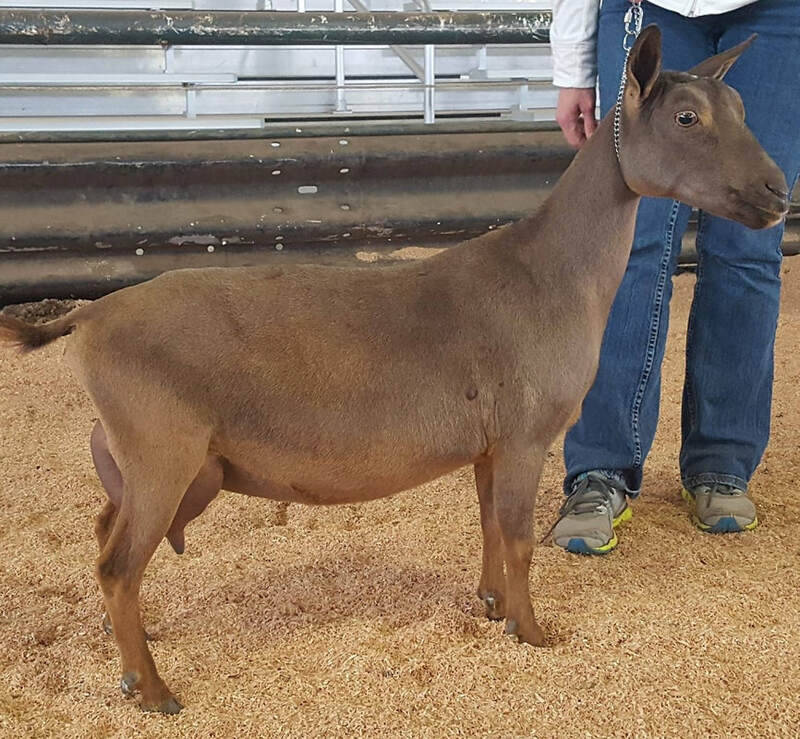 Bellafire DC Beach Bunny 1*M VEEE 90 - "Bunny"
Above: 2017 RVDGA Show (Pic courtesy of Gladdie Acres & handler Michelle), Sweet Alyssum as 5+yr old & Bunny as 4yr old in the Champion Lineup. Left: 2017 3rd Freshening, wanted to get something up here on the site to show her BEAUTIFUL strength in medial and her extremely large teats. She has LOVELY udder texture as well. Bunny milked 4.3lbs at 54 days fresh on her 1st milk test! 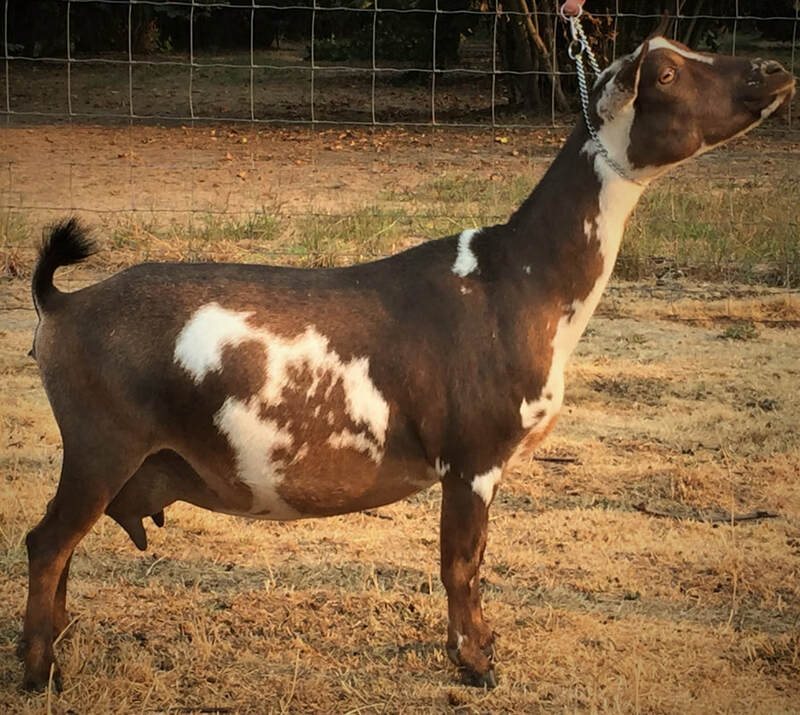 Beautiful long bodied, chocolate w/minimal white doeling. My third Deco daughter! So excited! Hoping the "Big 3" can do their daddy proud! Half siblings are Melody and Ally on our Senior Doe page. Bunny has freshened with a BEAUTIFUL first freshening udder, HUGE perfectly placed teats, excellent medial, super high rear udder... I am ECSTATIC over my 3 beloved Decoroso daughters!! Flashy, refined, leggy doeling. Very good feet and legs, strong level back & topline, long hip, long bodied, long lean neck. beautiful feminine face. I'm really looking forward to seeing this grand-daughter of Alethia CRC Ophelia 5*M freshen in 2015! Such an incredible mammary system! Overall probably one of the most CORRECT all-around mammary systems in our herd. LOVELY soft texture, large teats, excellent rear udder height, nice foreudder, and amazing capacity. Castle Rock Sweet Pavlova 7*M VEVE 88 - "Maggie"
Maggie milked a whopping 4.8lbs at 31 days fresh after a VERY difficult kidding on her first milk test in 2017! This tiny little doe can pack a BIG punch when it comes to her mammary system! 2016: kidded early May 2016 w/tiny triplets, sadly they didnt make it. Pics at left are first freshening, first 10 hr fill, 2 weeks post kidding. She milks out wonderfully and is a DELIGHT on the milk stand! 2017: Rough kidding of QUINTUPLETS! Including HUGE massive buck kid, one fairly normal size doe, and 3 tiny little doe's. ​2018: Quints again! UGH! Although all survived! Unfortunately I can't remember specific placings, she does well but not first in line yet, but her mammary systems always gets RAVE reviews from the judges. I think with more (mental) maturity, she'll do better in the ring lol! She excels in sharp dairy character, lovely mammary system, and rear leg angulation. Would really like to see her more level over the topline and rump. She has a wide rump & loin with big spring of rib, but her rump is more steep than I prefer. She makes up for it with a stunning mammary system with HUGE PERFECT teats and super strong medial and attachments! LOVELY! ​2017: 1 doe ret'd "Garden Party"
2014 UPDATE! Flower won GRAND CHAMPION JUNIOR DOE at the Oregon State Fair! She now has her ADGA Jr Leg! 2018: VVVV 86 Flower excels in dairy character and sharp feminine appearance. She has a super strong long topline and wonderful rear leg angulation, a lovely long lean neck & body. Flower freshened with a lovely mammary system! This doe is my absolute love, she is my little sidekick, my favorite girl, my BFF! Her general appearance & pizzazz just makes my heart skip a beat! Unfortuantely she got extremely sick & I almost lost her in 2016, and although she recovered, she seems to be very difficult to keep weight on and to keep at 100% ever since. Hopefully she can get back in the ring in 2019. Walsh Kids HH Serene Night V+VV 88 - "Serena"
Gorgeous doe, freshened with a LOVELY mammary system! Am VERY excited to get her in the ring in 2019! 2018 V+VV 88 - Serena is a lovely dairy doe with the perfect blend of substance. She has a beautiful head and long lean neck, big spring of rib and lots of width! She did suffer from a tough mastitis case for most of 2018 season, and it's reflected in her LA scores. Curbstone Valley Camarina V+VV 86- "Cami"
Cami, FF udder 2017 pic, 2nd freshening body pic. She is the farm favorite and greets EVERYONE; absolutely demands attention & loves. She is a dingy kinda girl,she is constantly chatting to everyone for attention. Her mammary is beautiful and she has decent capacity for her little body. She is very wide, very stocky, and correct. I would really like her to be a little more dairy and sharper boned. I also really wish she had larger teats.